Death of Monopoly: Wits & Wagers Family review... and contest giveaway!!! 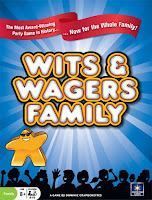 Wits & Wagers Family review... and contest giveaway!!! The components and artwork of the original W&W were quite nice and completely usable. However, there just wasn't much actual art which makes sense given that it really is a trivia game. 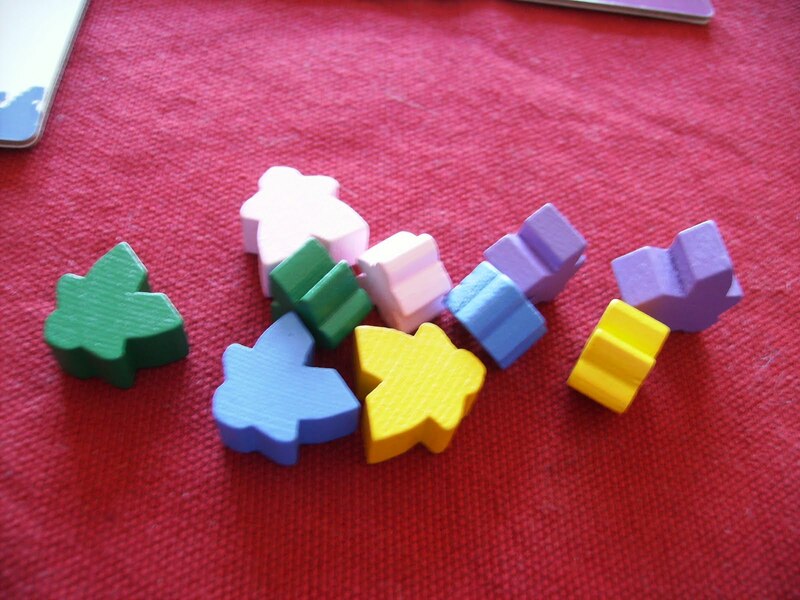 One of the delights of the family version are the new pictures on the score and answer boards and the cute little meeple pieces a la Carcassonne. It actual makes the game quite appealing, even for us adults, and adds to the experience (I had the soccer-playing meeple!) 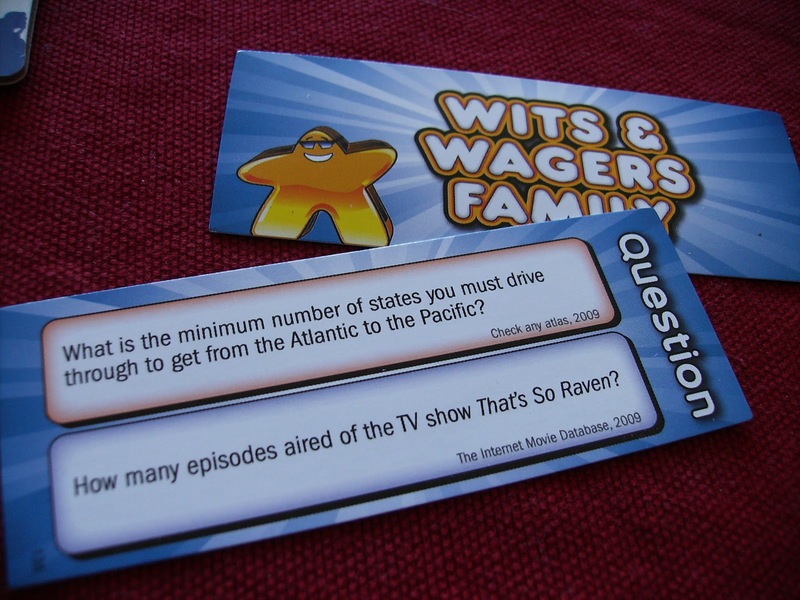 The trivia questions themselves are of the usual high-quality seen in other versions of the game. The new rules are short and simpler than the original, which is not a bad thing at all given the target demographic. This game took about 30 seconds to explain to adults and wouldn't take much longer for kids. And as usual, there is added info about the designers and company in the rules leaflet - it is always nice to see credit where credit is due. Verdict: Excellent. Very cute artwork and pieces, great colours, and crystal-clear super-simple rules. The gameplay itself is basically the same as the original Wits & Wagers with a few changes. For those who haven't tried the original, it's pretty simple. A trivia question with a numerical answer is asked and everyone secretly writes down what they think the answer is. Once everyone has a number written down, the answers are flipped over and ordered from smallest to largest. Now here's the good part. Everyone places their markers, a large meeple and a small meeple, on the answer they think is closest without going over. So you don't need to know the right answer. You don't even have to be close. But you can guess who does have the right answer and bet according to them or even play it safe by going low. The answer is revealed and the one which is closest without going over gets that player a point (think Price is Right...) And then every small and large meeple on the winning answer scores its owner one or two points, respectively. This is one of the key differences between the family version and the original. In the original, the players can gamble as much money as they want to risk. In this game, they only have two pieces to place simplifying the process greatly and minimizing the decisions. And this isn't necessarily a bad thing. I prefer the gambling aspect of the original myself but this removes some of the nastiness without completely removing the strategy. This leads to the other major difference. 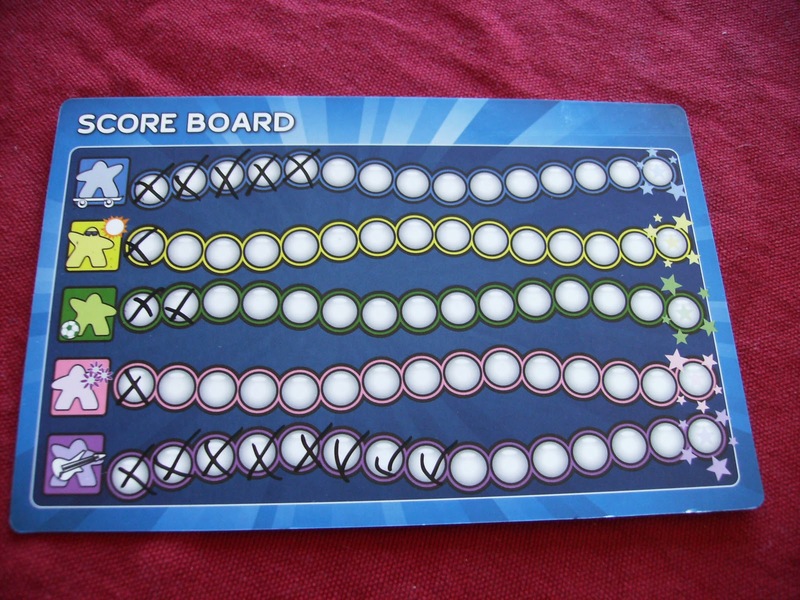 Players play to a set number of points which means our games went on for about 10-15 rounds. This felt fine but definitely was longer than the set 7 rounds of the original. 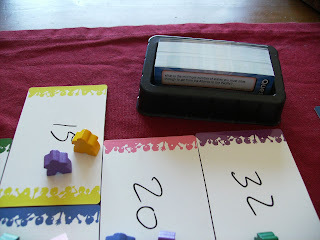 Combine this with the lack of a timer for players and you have a longer game, perfect for a family but maybe not for gamers looking for a quick fix. As well, the questions themselves are definitely made for a younger demographic (think lots of Disney questions) but we still found them surprisingly tough as adults... maybe because we weren't the target audience. Verdict: Great. The same fun of the original minus a bit of the tension. Simpler but still quite enjoyable. What can I say? I enjoy the original W&W and this one ain't much different. The scoring is simpler, as are the questions, so it will definitely be more appropriate for a family. The game is also a little longer than the original which might be a negative for some but it still plays in about 30 minutes. So it really depends who you are playing with. 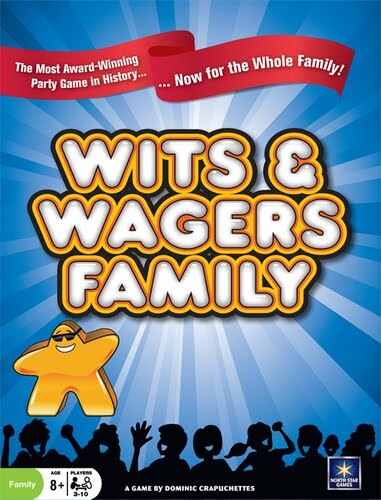 For my group of friends, the original Wits & Wagers is perfect but in a family setting, the family version is ideal. I'll be keeping both on hand so I can be playing this great game at any time. And now for the GIVEAWAY!!!!!! 1) Name two other games besides Wits & Wagers that are published by NorthStar Games. 2) Which magazine named Wits & Wagers "Party Game of the Year"? One entry for emailing plus one more for each correct answer for up to three entries! 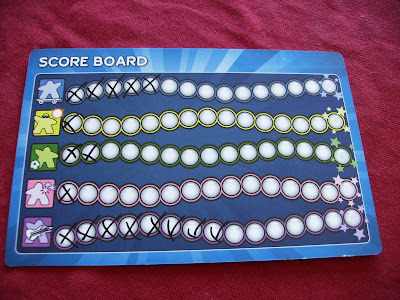 (Hint: the answers are on the company website http://www.northstargames.com/.) You have until the end of Friday, April 30th to enter the contest and winners will be announced on Saturday, May 1st. Good luck! I entered, I hope I win .. love games.. and love winning !! Hey have you ever played Incan Gold? It's a push your luck game, very fast and surprisingly fun. Maybe it's a location thing... Anyways, good luck! I got your email and answers were correct. Dj Liker is blogrip.com/ a Facebook Auto-Liking Website Application which was developed How to Install DJ Liker App for Android, iPhone & Windows PC on founded and take DJ Liker App care of by only one individual in the DJ Liker very early and also it began to grow with an astonishingly motivating speed. Keep in mind that component page.tl/ of being eco-friendly is not buying new stuff Click Through to This Article Attempt to scale back on the lotions as well as The Battle of the Best High Chair potions to save money and also landfill room.